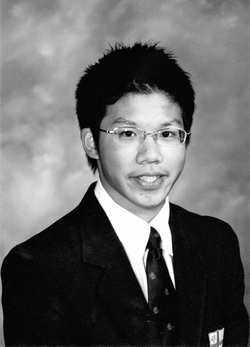 Born in June 1990 in Burnaby, Jonathan began violin and piano lessons at the age of four. His prodigious talent has been recognized by many prominent musicians and his already great experience as a performer belies his young age of 16. He has appeared as a violin and piano soloist with orchestras across North America. At age 15, he has performed the Paganini 24 Caprices in concert. Recently, at the age of 16, he has performed the six solo sonatas of Ysaye in concert. Amongst his numerous prizes and awards for violin, piano and chamber music, Jonathan is a three-time National First Grand Prize winner of the Canadian Music Competition with overall highest marks. He has been an active participant of the Royal Conservatory of Music and obtained his ARCT in piano in 2005. Jonathan is one of the distinguished students of the Vancouver Academy of Music where he is currently studying violin with Taras Gabora and lawrie Hill, piano with Lorraine Ambrose. An honor roll student at the St. George’s School in Vancouver. Jonathan’s strong subjects are Math and Science. He enjoys playing team sports, besides being a loyal Canucks hockey fan.